Bladder cancer (BC) represents a growing health care problem worldwide. In times of tight budgets and an aging society, new strategies for the transurethral treatment of BC are needed. Laser devices used for tumor vaporization and/or en bloc resection provide an alternative to parvenu strategies. Medline/Cochrane search was performed using following terms: bladder cancer, urothelial carcinoma, laser, en bloc, vaporization, photoablation, holmium, thulium, Ho:YAG, Tm:YAG, HoLRBT and TmLRBT. Last date of search was February 12, 2014. Eighteen publications in English were identified including 800 patients (Ho:YAG = 652 patients and Tm:YAG = 148 patients). 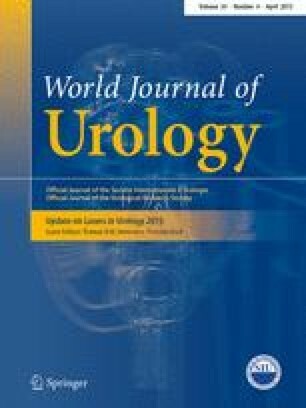 Data on en bloc resection techniques were presented in 10 publications, 7 publications provided data of tumor vaporization and one publication presented data on both. Level of evidence based on SIGN is mainly 3 (non-analytic studies); only three studies are level 2 (prospective case control studies). Tumor vaporization seems to be a promising alternative for the treatment of recurrent tumors in selected patients. It can be performed in an office-based approach without the need of general anesthesia. The use of photodynamic diagnostic might enhance surgical quality. The principle of en bloc resection should provide accurate staging in most cases; however, data on this important aspect are missing. Peri- and postoperative complications are scarce. Due to the nature of the energy source, bladder perforation caused by obturator nerve reflex is highly unlikely when using lasers. There is a trend toward decreased infield recurrence rates. Lasers are potentially useful alternatives to conventional TURBT, but systematical assessments using standardized classification systems and well-designed RCTs are needed to make results comparable. The authors have no conflicts to declare in relation to this article.